First, I have to say thank you to everyone who helped me see the light on Instagram yesterday! I really appreciate all the comments and emails - and esp the new followers. I promise I will follow you all back if I haven't done so already! I have seen a 1000+ pins on what to do with Bath and Body Works candles after they are finished. And while I do think the plain clear glass looks simple and chic, I wanted to do something more fun with them - you know, kick them up a bit! Going off this pin and using all the leftover glitter I have from my DIY Glitter Bottle Bracelet Holders, I blinged these babies out. 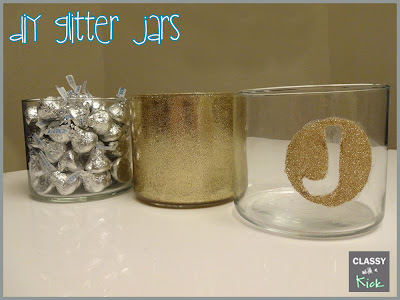 I made one solid glitter jar and one stenciled jar. For both, all you need is Mod Podge, Glitter and empty candle jars. Trick: I poured boiling water into the jars to get the last bits of wax out. This is by far the best way to do it. As the wax melts, it smells awesome and then when the water cools, the cooled wax floats to the top. 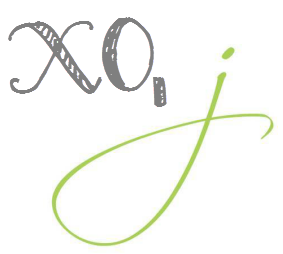 If you find some extra wax residue while washing them out, use baby oil or olive oil to remove it. So easy and much safer than putting glass in the freezer or boiling the entire jar. 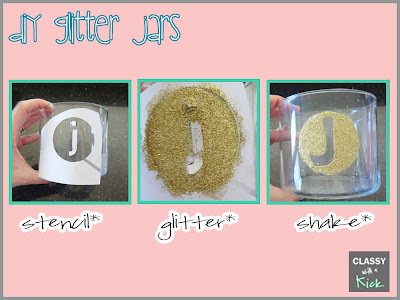 For the solid glitter jar, I mixed up the mod padge with the glitter and then painted the inside of the jar. This makes it so that there is less glitter fall off. 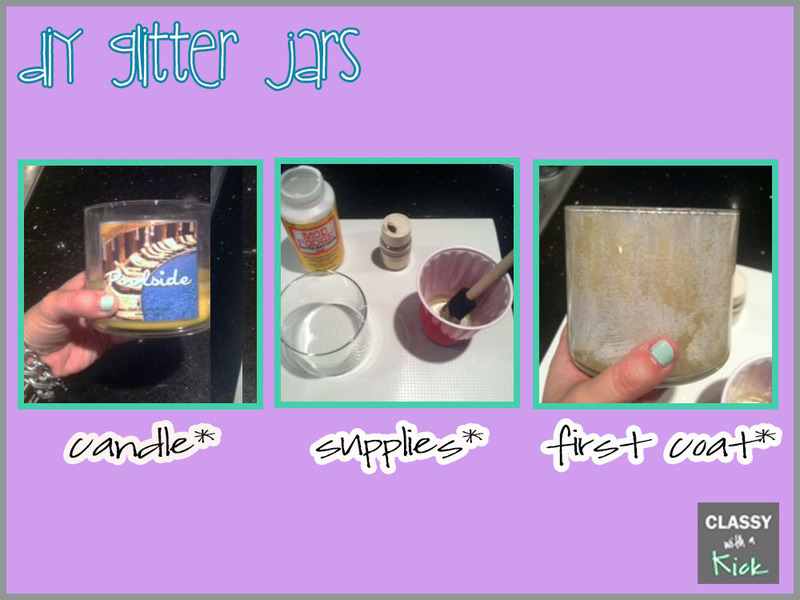 Also because the glitter is inside, the jar looks much more sparkly than if it were on top. You can see from the picture that the first coat doesn't look so hot. That's ok...you are supposed to do 3-4 coats to make it look good. The trick is light coats, this helps it look smoother and not chunky. 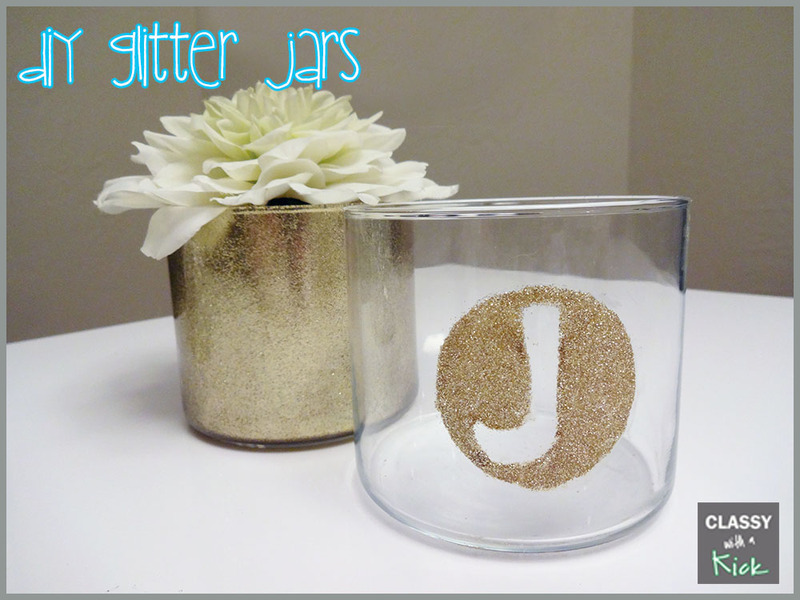 For the stencil jar, I created a stencil, taped it on, painted over the stencil with the mod podge and sprinkled glitter on top. This time I sprinkled because I needed a lot of coverage in a small area. The dot over the "J" didn't really work out as planned but I connected the two to make a longer "j". It's not the prettiest but I know that next time, I will print out the stencil on label paper to make a sticker. That way it will stick better and have cleaner lines. Now I have two super cute jars to use as vases, candy dishes, and containers. Have you ever re-purposed empty candle jars? What fun Pinterest projects have you done recently? 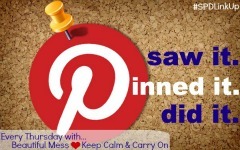 And...if you did a DIY Pinterest post lately, join me in linking up with the SPD crew at the Saw it. Pinned it. Did it. link up! Oh my gosh! I am obsessed with these!! They turned out great!! I will definitely be trying this! oooh i love this project - what a smart idea to re-use the candle jars. i'll have to try this! 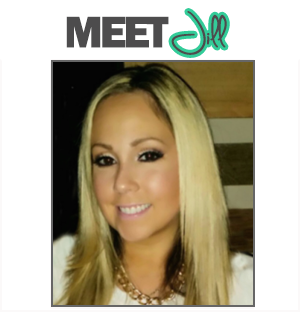 These are SO cute Jill! Meg is doing something similar on mason jars for her wedding, I'll make sure she looks at you tips! I love the glitter!! This is such a cute little DIY! I'd love to try this sometime ;) Thanks for the awesome idea! Just pinned! i've totally modgepodged/glittered my vases too, but NEVER thought to do a letter or outline like that! LOVE it and you've totally inspired me for some fun new glittered ideas!! These are great! 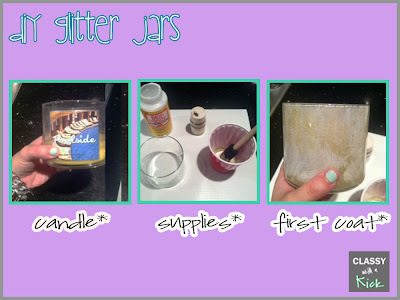 I love that you put glitter inside the jar...I would not have thought to do that! 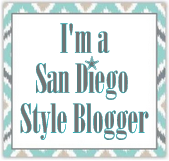 Stopping by from the linkup today! I tried out some "diy etching" on a glass olive oil bottle. Your project turned out better than mine, ha! LOVE this! I just had so many ideas go through my head... love diy's! awesome idea! I love easy DIY - and your initial candle turned out so well! 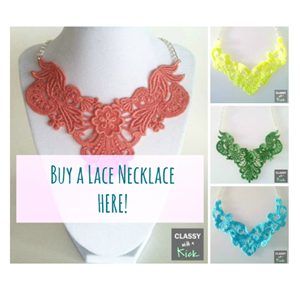 These are so cute, what a great DIY! Wow, what a great idea - definitely have to try this out, since I'm currently redecorating my bedroom.